Certainly its Midweek Madness as IPL is going crazy by having third double header on a week on this same week. Game 1, CSK in the form of their life met KXIP in their den, Saha & Hussey pair started the innings from the place where they left, As both departed bit earlier today than expected and Dhoni went for a non existent second run to leave the crease very early. So it was another Super Kings day to step up the scoring shoes and it was none other than IPL top scorer Suresh Raina, who did in style with a Century the only record missing in his IPL career resume. 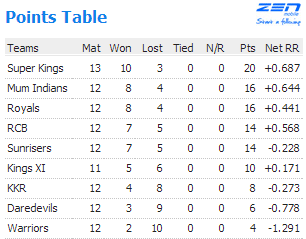 Shacky start by KXIP losing David hussey bit quick didn’t help them either. But Shaun Marsh & David Miller struck a partnership between them and got the important runs at crucial junctures and kept the chase always on till the last 6 balls bowled, Dwayne Bravo just made the important difference between both sides by just bowling the last over for just 3 runs and picking 3 wickets. 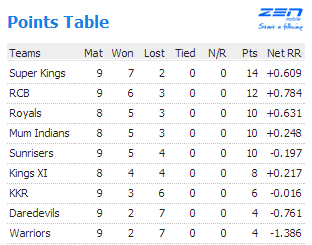 CSK continue to roar in their den. Game 2, not much fancied one as of now, Pune hosting RCB, Yes, What you think is right, this is the team which Gayle torn into pieces and went on to make record books re written. RCB won the toss and went on to pile up the runs in gradual pace today because Gayle has to depart bit early. However it is, in the end its ABD who stole the show and game from Pune Warriors India, by picking 26 runs in the last over bowled by Dinda. PWI as always started of by losing wickets in regular intervals, but for one change Robin Uthappa played a matured and classy knock but it was a lone battle waged which was too much and in the end Pune fell short. Giving RCB the much needed first away for this season. 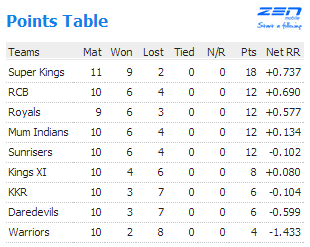 – 7 consecutive wins by CSK now equals the highest no. 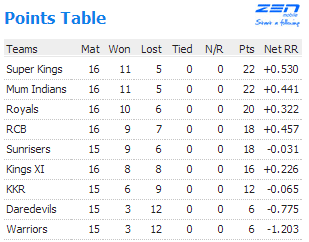 of consecutive wins recorded by RCB in IPL 2011. – Shaun Marsh scored his 15th IPL Fifty, highest by any individual player for KXIP. – Raina bowled his first over for this season and went for 19 runs. – Now Mohit Sharma has taken 10 wickets in the powerplay over, highest by any team bowler. – Raina became the 21st Batsmen in IPL to score a century, he bettered his previous best of 98. – Mike Hussey was out by Stumping for the first time in his IPL career. – 631 runs scored by Hussey – Raina is the second best by a pair in Chepauk, List is also topped by Hussey – Vijay Pair. – Aaron Finch becomes the second batsmen to be out right after scoring a six. – 26 runs scored off in the last over by AB against Ashok Dinda is the second highest, David Hussey conceded 27 runs is the topper. – 75 runs scored by Uthappa is the highest for him in his IPL career. 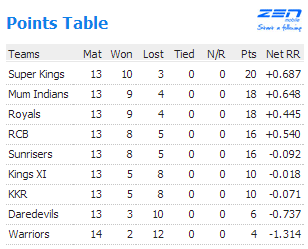 – RCB has hit 484 sixes across all season which is second highest; list is topped by as expected CSK with 499 sixes. – Saurabh Tiwary & Gayle is the 32nd opening combination tried by RCB, highest by any team in IPL. – Royal Challengers won their first game away for this season, after losing 4 away games in a trot. – Gayle became the first player to score 500 runs for this season. – Pune Warriors now have lost 10 games out of 13 played in their home ground Pune. 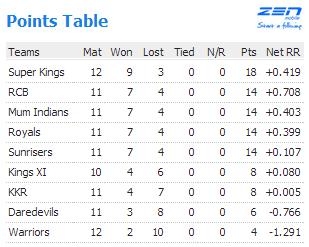 – With the win by RCB batting first, as of today, 21 games are won batting first and 23 in chasing, and 2 ended up in a tie. A Game of D’s, Dhoni Vs Dravid, Mass Vs Class… Always a treat to watch this combination for any cricket lover and definitely for me too…Dravid won the Toss and decided to Bat first, A simple one liner was the royals batting, Just Watson show all the way, Showed no mercy to any bowler ad he hardly worried about what length or line they bowled, Sheer display of Watto Powerhouse which allowed him to go past first century mark in this season of IPL. Binny and other Rajasthan players played around him to get to a score of 185 runs in 20 overs. – Shane Watson scored the first century of this season of IPL; it is also the 25th century for IPL tournament in all seasons. – Watson’s 101 runs over shined Shewag’s 95* for the highest score for this season. – Shane Watson’s Century is also the fourth one for a Rajasthan Royal Player. – Out of 7 innings Murali Vijay is out for a single digit in 4 of them. 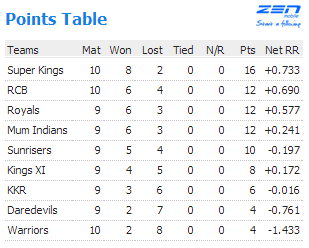 – 58 runs scored by CSK in the powerplay overs is the highest for them in this season. – This season has been made to wait longest to get the first century (30 matches), previous season was the slowest which took 18 matches. – This is the first time Rajasthan Royals have lost a match when they have scored more than 162 runs, their record stands 15 – 0 till today, as now it will be rewritten as 15-1. – Suresh Raina scored his 15th IPL fifty and also his first six for this season. – Chennai has chased 5 times (including today) the score anything above 185+ and lost 3 times. – Ravindra Jadeja scored his 3rd IPL duck and first as a Chennai Super King. – 49 runs conceded by Kevon Cooper is the highest in any T20 international game. – This is fourth time in IPL out of 25 occasions an IPL century has ended up in a losing side, previous century scorer are Symonds, Yusuf Pathan, Tendulkar & now Watson. – Michael Hussey became the second player after Virat Kohli to breach 300 runs mark for this season. – Both 185 runs target set yesterday by PWI and today by RR are achieved by chasing team exactly in the penultimate ball of the match, this is also the second match for CSK to win a game with just a ball to spare.